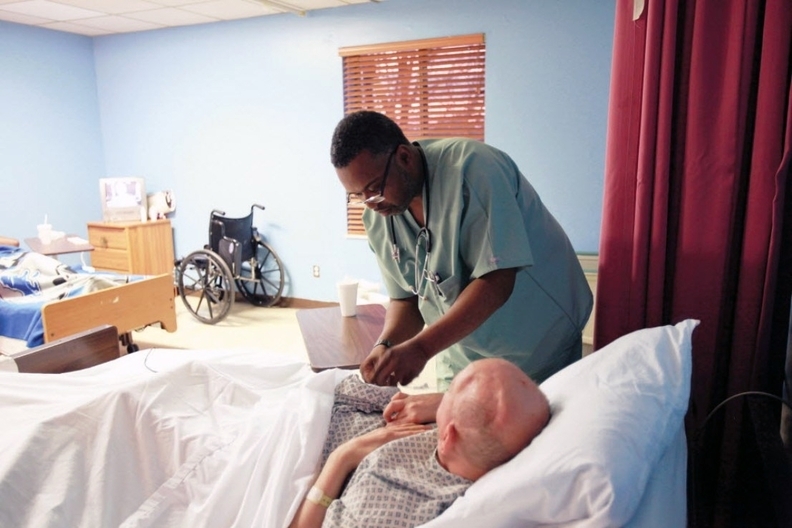 Long-term care hospitals around the country are hopeful the Trump administration will permanently abolish a proposed policy that would dramatically reduce their Medicare reimbursement. The Trump administration said Aug. 2 that it will freeze the so-called 25% rule that dings Medicare reimbursement rates for hospitals for one year while it assesses whether the policy is needed. Under proposed rule, if more than a quarter of a long-term care hospital's patients come from a single acute-care hospital, the long-term care hospital would receive a reduced Medicare reimbursement rate for patients exceeding that threshold. The reduced rate would be between 50% to 60% less than what they would have received otherwise, according to the National Association of Long Term Hospitals. Long-term care hospitals will avoid an $85 million reimbursement cut in 2018 thanks to the one-year freeze, according to the CMS. "This is a step in the right direction and hopefully the rule will go away entirely," said Anthony Misitano, CEO of Post Acute Medical, a Pennsylvania-based operator of long-term acute care facilities. The 25% rule was first introduced in a 2004 inpatient pay rule and has been delayed frequently by both the CMS and Congress in response to provider push back. Most recently, the 21st Century Cures Act delayed its implementation until Oct.1, 2017. The policy not only would cut into providers' bottom lines, but they also worry it could impede access to care by forcing them to turn away patients in need of their services. "Just because of an arbitrary percentage we would have to tell someone we couldn't take them," said Ed Cooper, president and CEO of Acuity Healthcare, a North Carolina-based long-term care hospital company. "It just didn't make any sense." Long-term care hospitals already face reduced Medicare funds due to a new site-neutral payment policy that kicked in last year. The CMS projects that payments to long-term care hospitals will decrease by approximately 2.4%, or $110 million in fiscal 2018, because of that change. That's on top of the $363 million cut they received this fiscal year. "The 25% rule would have added to that which would have definitely put certain hospitals in jeopardy," said Michael Cronin, vice president of reimbursement and government affairs at LifeCare Hospitals, a Texas based chain of 26 long-term care hospitals. The 25% rule stemmed from concerns that acute-care hospitals were prematurely discharging patients to a long-term care hospitals even though the acute care hospital could continue to provide the appropriate level of care. The CMS believed this was most common in instances where hospitals shared a common owner who pushed patients to a long-term care hospital in order to receive the biggest Medicare reimbursement. The industry has disputed that claim for years, and noted that the new site neutral policy makes the matter moot anyway. "The site neutral payment has at least given CMS a pause since payments are not an issue anymore," said Amit Mohan, president and CEO of Barlow Respiratory Hospital in Los Angeles. Hospitals were most concern about what the 25% pay rule would do to those in rural or underserved areas with one major acute-care hospital that sends patients to the facilities. "There is nowhere else where that (long-term care hospital) can go to get cases," said Lane Koenig, director of policy and research at the National Association of Long Term Hospitals. "You're kind of screwed in those instances." The CMS tried to help providers in this scenario by raising the threshold 50% for hospitals in markets with few acute care hospitals. However, that higher threshold still leaves some hospitals in a lurch. Lou Little, CEO of Sparrow Specialty Hospital, a long-term care hospital in Lansing, Mich., said its sister hospital Edward W. Sparrow Hospital is the dominate acute care player in its market. It accounts for as much as 65% of his hospitals' cases. Turning away patients in need isn't an option for Sparrow Specialty. It would need to find ways to draw additional patients from other sources to avoid serious financial losses. "The reduction would be a real haircut," Little said. "Any margin you would hope to have would go away." An​ edited​ version​ of​ this​ story​ can​ also​ be​ found​ in​ Modern​ Healthcare's​ Aug.​ 14​ print​ edition.